What Type of Low Back Pain Do I Have? Low back pain that generally responds well to manual therapy is called mechanical back pain. Whether it is sciatica, sacroiliac joint pain, muscle spasm, an irritated spine (facet / zygopophyseal) joint, an injured disc, or a likely a combination of many issues, it is almost impossible to be 100% certain even with an MRI.It is categorized as mechanical back pain because most studies show that it is difficult to determine what structures in the back might be causing your pain. Nonetheless, many structures in the lumbar spine and hips are pain sensitive structures that can be symptomatic and cause low back pain. Palpation and physical examination can sometimes help to determine which tissue needs to be focused on. Often, patient history is enough to suggest the culprit. Having a good indication of the involved structures helps the good chiropractor determine what specific techniques should be used, what structures to target and what exercises to complete. This list is not comprehensive but lists some of the major categories of low back pain generators and their associated signs and symptoms. Pain originating from the muscles and joints of the low back, pelvis and, or hip. Muscle pain can be from general tightness, a muscle strain (small tear), or from an active trigger point. This type of pain generally is described as being fairly local, of low or medium pain intensity, rarely of a burning or electric character, and more as dull, aching, stiff or sharp. It is usually found to occur over a broad area of the low back, a tight band on both sides, or a focal pain off of the midline. It is rare to encounter muscle pain without a joint restriction and vic versa. Scientific studies have determined it is very difficult to isolate what anatomical structure causes this type of low back pain from physical and imaging examination, which may explain the generality of the symptoms. 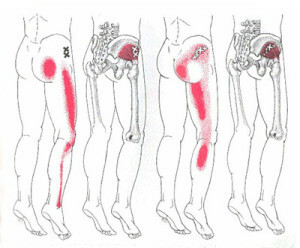 The typical refferal pattern for SIJ PainThe SIJ is a known pain producer and is located over the buttock and can travel down into the thigh but generally not below the knee – it is a typical pain producing structure in pregnant women, often exacerbated most by transitional movements between sitting, standing and lying. SIJ Pain is typical sharp or a deep and dull felt superficial to the sacroiliac joint, which is located deep in either buttock. The pain is typically generalized over the buttock but can cause referral into the thigh, typically not back the knee. The character will be not burning, electric or numbing. Triggers points are tight bands or loci of active muscle contraction that are painful to the touch and can cause pain to travel away from the site of injury. Pain that is specifically produced by nerves that provide sensation to the vertebral bodies, intervertebral discs, spinal canal and other very central structures. This condition is typically aggravated by straining (laughing, sneezing, straining), and activities requiring flexion and compression. Typically it is thought these injuries result from a tear of the annular fibres around the intervertebral discs or from a vertical disc herniation. Discogenic pain is most often midline and is known to cause pain travelling as far as the ankle. While commonly misused, sciatica implies more than local back pain. Sciatica generally implies an aggravation of a the S1 nerve root or sciatic nerve causing (radicular) pain to travel down the back of the thigh, leg and sometimes foot from the low back. Its character is most often described as sharp, or electrical like a lightening bolt that is exacerbated by bending forward or raising a straightened leg. There are many causes of sciatica including g nerve root impingements, disc herniations, pirifmoris syndrome, or a host of other causes. In cases when nerve roots or nerves other than S1 or the sciatic are involved respectively, nerve pain of a similar character can be localized to other areas of the leg or back. This is a more serious element of back pain that one should seek the attention of a medical doctor, or chiropractor as some causes of it can be serious. This is a term to indicate pain down the side of the hip, into the thigh, and potentially the side of the leg and foot. While it can be sharp, often indicating a L3 or L4 radiculopathy or nerve root impingement, it is usually perceived as dull, achy, difficult to localize and broad. Possible causes include trigger points in the gluteus medius, gluteus minimus or quadratus lumbroum, greater trochanteric pain syndrome (commonly known as hip bursistis), occasionally osteoarthritis if reproduced with hip movement, and other less likely causes. A thorough physical exam and history taking is essential in differentiating the cause of this commonly seen condition. Hip osteoarthritis can produce posterior buttock, and, or pelvic pain in a smaller number of cases often with associated hip pain. It will generally be of a dull ache character and can be constant but will be primarily associated with hip movement. Albeit very rare, in 3%-5% of cases low back pain may arise from organs of the abdomen or pelvis including the colon, kidneys, aorta, reproductive organs, pancreas, or from serious conditions like cancer, infections or inflammatory arthritis. These cases are few and far between but can be serious if not given the proper medical attention. Significant bodily changes or symptoms like these might necessitate a need to seek medical advice.